I have been having a great time at Orlando Hamcation that this year features the ARRL National Convention. One of the highlights was getting a first hand look at the brand new Icom IC-7300. Icom had a demonstration model on display that was shipped from Japan just for this show. As far as I know, it’s the one and only IC-7300 on display in the USA at this time. This radio has generated a lot of interest on the Internet since it was announced. Many in attendance in the big crowd on Friday made a bee-line for the Icom booth to get a first look at the IC-7300. FCC approval is pending, and the radio is expected to be in production and available for sale by the end of March, 2016. I had a little bit of time at the show to take a look at the radio. It is the perfect size for a ham shack or a portable operation. The big 4.3 inch LCD color touch screen is bright, crisp and clear. The many features of this radio activated by a simple touch of the screen were fast and responsive, and the menus are intuitive and very easy to navigate. A long press of buttons and certain touch screen functions bring up secondary controls that are also easy to navigate and operate. This is not a full review, but I found the entire front panel to be well laid out with good ergonomics in mind. The IC-7300 weighs just under 10 pounds, with dimensions of 9.45 x 3.7 x 9.37 inches. It includes an SD card slot on the front, and connections for USB, antenna, external tuner (although it has a built in auto tuner), key, ALC, accessory, CI-V, speaker and others. As I stood and played with the rig, I thought how great it would be on the desk, but also how perfect it would be for portable operation for Field Day, NPOTA, and other similar activities. Of course, one of the great features of this radio is the big real-time spectrum scope with waterfall. It also has a great real-time audio scope. These scopes look fantastic on the 4.3 inch TFT LCD screen. One great feature of the scope is the ability to use your finger to touch and tune to a signal displayed on the scope. This feature is responsive and quick. Icom in the brochure for the IC-7300 touts the great receiver in this radio. The specs indicate a RF direct sampling system with 15 discreet band pass filters, with “class leading RMDR and phase noise characteristics”. Icom also states that the IC-7300 has a new “IP+” function that greatly improves 3rd order intercept performance. All of the hams I spoke with at the Icom booth were very excited about the potential for this receiver, but there was no signal connected to the radio at the booth to hear how good it really performs. Fortunately, after the show was completed for the day, Will (AA4WJ) and I were able to take the IC-7300 with us in order to test it out on an antenna. We did not use the transmit functions on the radio, but were able to test out the receiver at my campsite with a Budipole antenna on 40 meters. Following are the short videos we took as we listened to the radio and worked through some of its many features and functions. Unfortunately, time would not permit us to video all of the menus and features, but we hit the highlights. The audio you hear is from the radio’s internal speaker. From our quick run through, I came away with the opinion that the receiver lives up to the expectations I have heard from many hams. I’m very excited about this new addition to the Icom lineup and look forward to having one in the shack. Enjoy the videos. A big thanks to Ray Novak, N9JA and Will Jourdain, AA4WJ of Icom America for allowing me to test out this great radio. This entry was posted in Uncategorized and tagged Amateur Radio, Ham Radio, HF Radio, HF Transceiver, IC-7300, Icom, Portable Operation. Bookmark the permalink. Thanks VERY much. That’s my next radio if it comes on the street at a reasonable price. Thanks so much Bill for your videos and review of this new Radio. I have one on order and am very excited about this new SDR radio. Thanks much for the active demo. I got a chance to see the unit at the Orlando Hamcation too, but didn’t fiddle with it too much. Looks like it is going to be a pretty cool radio. By any chance did you ask them if the will be offering feature updates to the unit over time that can be updated through firmware? This is one of the beauties of SDRs. A good example would be, they could easily add the controlled envelope SSB algorithm mentioned in the Feb 2016 QST. Thank you for video, close to operator point of view…iLike. The 7300 appear as new milestone in the radio: an “all-in-one” SDR, without the feature typical of the SDR used ONLY by computer, but with the feature typical of the common radio. The user friendly interface and look, probably will determine the market success. I believe that the Icom’s engineers have intentionally limited the functions, because if this radio come equipped with SDR output to computer and PC based software for multi receivers and similar ones, with few dollars could stop the next versions. My personal opinion. 73 . .
Also saw this rig at Hamcation, 2016. Begged and pleaded at the last hours of Sunday for a ballpark price figure. Under$2000 was the utterance from Icom. 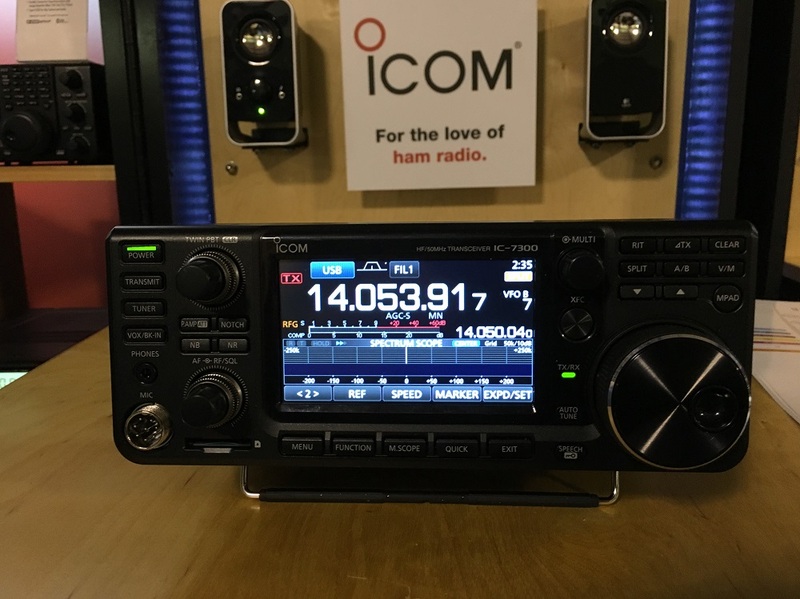 Thank you for the nice write up on the new Icom IC-7300. The videos are well done and show how beautiful the display is. I have mine on order and am looking forward to putting it through its paces. Hopefully it will perform as good as it looks! In the US, hamradio.com shows the price as just under $1,500 USD. I am not affiliated with that website or company. Thanks Bill, I am exited as anyone coments here, mine is been ordered already as well, at the end of March I should receive it tyey told me at the store. Price is very confortable for most of us and I hope will be a good radio. I live in Tampa Florida USA, and the only dealers that had the 7300 were all out of state. I just ordered on last night from Main Trading in Texas off of Ebay. I am wondering if my Electro Voice RE 20 Mike will have enough drive for this radio ? After having watched these 4 plus over 100 video’s on the 7300, i took the plunge and did a deal with one of the major UK dealers, my FT991 plus £550, i’m expecting delivery in the next 7 days. I hav’nt been so excited about a new radio for years, not looking forward to setting it up for digi-modes tho hihi. Thanks for the video’s, much appreciated.